The Skete of Sts. Anthony and Theodosius of the Kiev Caves in Ordynki, near the town of Narev, the only Orthodox hermitage in Poland, celebrated 500 years of the holy site on which it is built. On Saturday, the feast of Sts. Anthony and Theodosius, the Divine Liturgy was celebrated at the skete with pilgrims from 5 different countries. 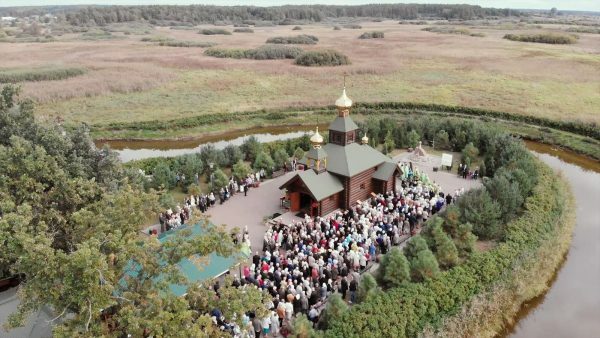 A memorial stone with text about the miracle with the icon of St. Anthony that began the sacred history of the site and a bell, dubbed “the Voice of the Upper Narev Valley,” were consecrated, reports the Belarusian Orthodox site sobor.by. This year marks 500 years since the miraculous appearance near the village of Ordynki of the icon of St. Anthony of the Kiev Caves to Prince Ivan Mikhailovich Vishnevetsk who was lost in the local swamps near the Narev River. He later built a chapel on the spot as a thanksgiving offering. By the end of the 16th century, several Russian noble families had built a monastery in honor of the Lord’s Ascension, which later sheltered monks of the famous Supraśl Monastery, which had been captured by Uniates. Throughout the centuries until the Orthodox revival in Podlasie, this inconspicuous monastery, hidden away in the Narev Valley, kept the Patristic faith. The monastery held out against the machinations of the Jesuits and was revived after the tumultuous years of the Northern War. It was abolished in the 19th century, but the veneration of St. Anthony of the Kiev Caves continued in the surrounding villages. The revival of this holy place in modern times is also connected with Supraśl Monastery, the former abbot Archimandrite Gabriel (Gib) having built the only Orthodox hermitage in Poland there. The Skete of Sts. Anthony and Theodosius will celebrate its 10th anniversary next year. People come to the skete for prayer, for spiritual advice, and even for consultations in herbal treatments, for which Archimandrite Gabriel had received a blessing from Elder John (Krestiankin). Even non-Orthodox pilgrims come, and Fr. Gabriel’s heart is open to all. Archimandrite Gabriel noted that he would like to also build at the skete a large trapeza church and a bell tower 200 feet high to hold the bell that was consecrated during the celebrations. Following the liturgical celebrations, the pilgrims were treated to a hearty and delicious lunch.